The Cape Town space blank projects is the winner of the Armory Show’s second annual Presents Booth Prize, awarded to one of the younger galleries showing in a special section of the fair on Pier 94. 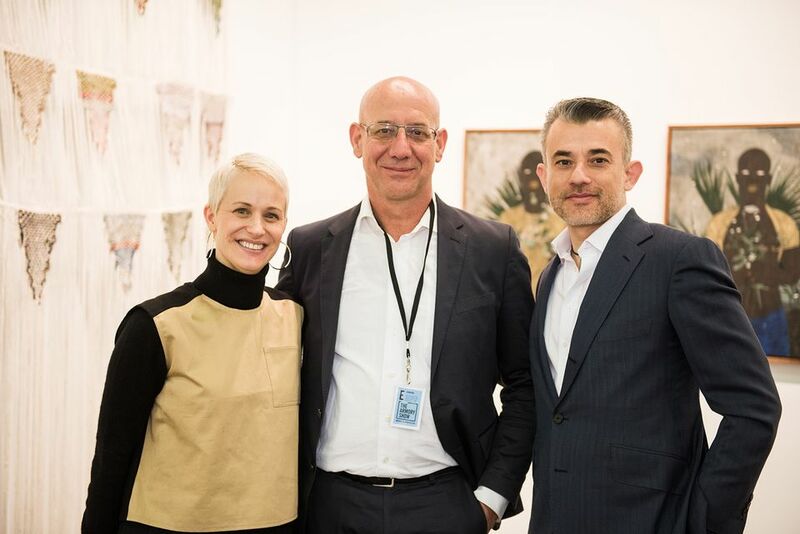 The prize-giving jury—the curator Naomi Beckwith, and the collectors Glenn Fuhrman, Marguerite Hoffman and Pamela Joyner—selected the gallery for its display of work by the emerging South African artists Igshaan Adams (35) and Cinga Samson (32). The two-person show of works that “deal with issues of identity, is both relevant and compelling and was a standout for the jury,” says the Armory’s executive director Nicole Berry in a statement, adding: “We are happy to have a gallery showcasing work that is coming out of South Africa, a vibrant and dynamic art community.” The $10,000 award is sponsored by Athena Art Finance Corp, and it’s chief executive Andrea Danese, congratulated blank projects for its “energy, creativity and dynamism”. "We were surprised as it's a quite a simple hang," says blank projects' owner Jonathan Garnham of the stand's three small-to-medium-sized paintings by Samson and one hanging textile wall piece by Adams, who recently won South Africa's Standard Bank Young Artist Award. "There is kind of a conversation happening between the two artists," Garnham adds. "Igshaan saw Cinga's paintings and I think was responding to them to a degree". Both artists, in unconventional and quiet ways, celebrate the new possibilities afforded black men of their post-apartheid generation, the so-called born-frees.